Often, the mutationists/Mendelians are painted as fools who could not think their way through evolutionary theory, creating what David Hull called “an inexplicable embarrassment.” This embarrassment is the delay of the (apparently inevitable and obvious) synthesis between Darwinism and Mendelism. Several historians are guilty of such claims, including Peter Bowler, who wrote in Evolution: History of an Idea (2009), that “it would be several decades before the geneticists realized that mutations cannot create new species and reluctantly called in natural selection to explain why some mutations increased their proportion in the population while others declined.” My previous post showed that this claim is outright false – Punnett was making use of natural selection by 1912! An important part of the Story is what we call the “Missing Piece.” (Note that Peter Bowler actually rejects this part. No historian recites the entire myth; it is composed of pieces.) This is exemplified by Richard Dawkins, who wrote with regard to this period: “Mendelian genetics was thought of, not as the central plank of Darwinism that it is today, but as antithetical to Darwinism … it is extremely hard for the modern mind to respond to this idea with anything but mirth.” And also by historian William Provine, who wrote, “Mendel’s theory of heredity was the perfect complement to Darwin’s idea of natural selection.” So why this period is inexplicable is because, according to many scientists and several historians, Mendel provided “the Missing Piece” to Darwinism: a theory of heredity. And for some reason, according to the Story, the mutationists could not synthesize the two theories; it had to wait for the population geneticists and the Modern Synthesis. These (and other) claims are a mixture of being misleading or false. The Mendelians thought evolution proceeded through leaps or saltations, i.e., mutations were large. The Mendelians opposed natural selection. Jean Gayon has argued that addressing (2) is the key to understanding the period. As seen in my previous post, we largely agree – the (forgotten) changes the Mendelians made to natural selection are critical. The Mutationism Story changes to the following diagram when taking Gayon’s revision into account. However, we also argue that this doesn’t capture the full story. Why they changed natural selection makes sense after (1) is addressed. And the diagram becomes a whole lot more complicated! Arlin and I argue that the key to understanding this period is what we call the Fluctuation vs. Mutation Distinction, almost universally misconstrued by historians as an issue of the sizes of variations (small vs. large, continuous vs. discontinuous), when instead it refers to the causes and consequences of different modes of variation (environmental vs. genetic). Yes, Hugo de Vries’s mutation theory claimed that new species were created by mutations. However, such mutations did not need to be large (but they could be). All that was needed for the production of a new species was a “progressive mutation” that created a new factor with no matching counterpart in another individual. In modern terms, (I speculate) the mutation theory would claim that a new species is created when a new gene is produced that cannot pair up with an existing allele in another individual, i.e., the Mendelian laws of inheritance do not apply. Thus, the size of the mutation’s effect did not matter. So for the rest of the Mendelians (our paper contains a multitude of quotes showing this), mutations did not necessarily create species, as De Vries had argued. Instead, they generalized his mutations to be any definite and discontinuous (not necessarily large) change to the internal constitution of the organism. They then combined it with Mendelism to create their own evolutionary synthesis. The constant refrain of Mendelians that variations are discontinuous sounds extreme if we see it as a claim about sizes. Instead, it was a claim about mechanisms and consequences that we all accept today: variations originate not by one factor gradually morphing into another, but by discrete events that generate a new (allelic) type. Thus, claim (1) falls. In any case, the claim is inherently contradictory. An associated historical claim is that what changed the Mendelians’ views of mutation were Morgan’s mutating fruit flies. This makes no sense. Morgan’s white-eyed fly is a “large” mutation in that a white eye exists outside the normal range of variation. It could be argued that white-eye showed that mutations do not create new species. But that doesn’t make sense either: the Mendelians did not think the short and tall varieties of Mendel’s peas were different species. Nor the roosters with differnt shaped combs or rabbits with different colored hair. Saying that a core tenet of Mendelism was that mutations are large is false. Why the Mendelian emphasis on “discontinuity” and “definiteness”? Because the articulation of “mutation” ruled out other kinds of variation as important to evolution. The Mendelians called these other sorts of variations “fluctuations,” and controversially, claimed that such unimportant variations had been the core of Darwin’s own theory. We argue they were right in doing so. Contra the Missing Piece, Darwin’s Theory of Natural Selection was not actually missing theories of heredity and variation. Darwin proposed and incorporated ideas such as pangenesis and Lamarckism to account for these phenomena. Relevant to our discussion, he made three specific commitments**: (1) “Natura non facit saltum,” i.e., gradualism, (2) variations arise from changes in the external conditions of the parents, and (3) blending inheritance. Johannsen’s results, republished in Morgan’s 1916 book. Note that the five pure lines, when combined, create a population showing continuous variation. 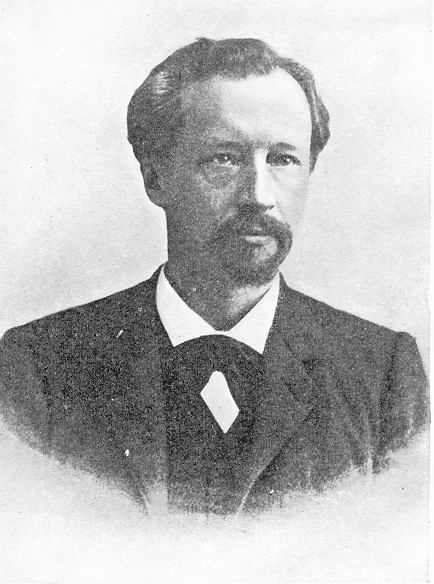 The nature of the distinction becomes clear in the context of Wilhelm Johannsen’s oft-discussed pure line experiments. When selecting for larger or smaller size in self-fertilized beans (a “pure line”), Johannsen found no effect. Even though there was variation, the variation was non-selectable, i.e., it was non-inheritable. This is obvious to us now, but why Johannsen (and many others) attempted to demonstrate this makes sense with regard to the Flucation-Mutation Distinction: if a changing environment stimulated inheritable variation, then selection should work! What Johannsen showed is that internal variation, or mutations, were required to make a pure line larger or smaller. While such a distinction is obvious now, it was not so at the time. Although its effects were masked by later developments, this distinction is so fundamental that it breaks Darwinism. (The particulate nature of genetic factors also breaks Darwinism (blending inheritance), but this is more widely acknowledged.) Natural selection no longer has free reign to act upon an endless wealth of minute variations supplied by a constantly changing environment. Selection instead has to wait for discrete mutations. This is a key difference between Mendelism and Darwinism: the Mendelians argued that mutation was the source of evolution’s creativity; not natural selection. These differing points of views were the subject of William Castle’s debate with the Mendelians (sadly, I couldn’t find any good online resources on this). As discussed in my last post, the Mendelians did not leave the problem there. Recognizing what they had done, they also changed how selection worked. Contrary to the Mutationism Story, the Mendelians did not oppose selection. They did oppose Darwinism, meaning, there are actually multiple ways to formulate natural selection. 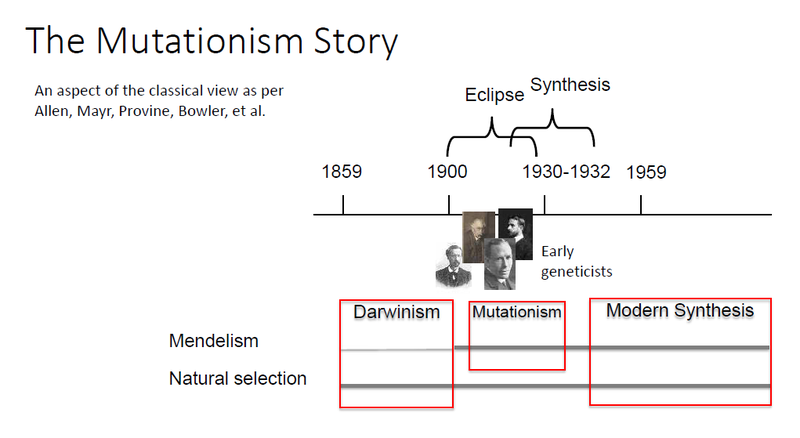 When the Mutationism Story states that the Mendelians delayed the synthesis of Mendelism and Darwinism, they are partly right; what it misses, however, is that Darwinism was dead. In the meantime, the Mendelians salvaged natural selection and helped create the basis of modern evolutionary thought. These two short posts on our paper get at the substance of our paper but in a somewhat superficial way. I had to skip over a lot of our reasoning, as well as some nuance, to concisely articulate our argument (in ~3500-4000 words!). Take a look at our paper, it’s open access, and let us know what you think! If you have any questions or comments, please post them below. * Also, there are major differences between De Vries and the others (discussed briefly), as well as amongst each other (not discussed), but here, those differences will only be mentioned where needed. ** By commitments, we mean that Darwin explicitly rejected alternatives when they were proposed to him. This matters: Darwin’s Theory of Natural Selection is not a theory outside of history; it is instead contingent upon the choices and commitments Darwin made. Kele, nice job again. I wanted to elaborate on what those 3 figures mean. The rows represent concepts or ideas that are parts of larger evolutionary views and have some kind of continuity over time. The red boxes represent views– they contain ideas (rows) and they have a width that suggests their period of importance. 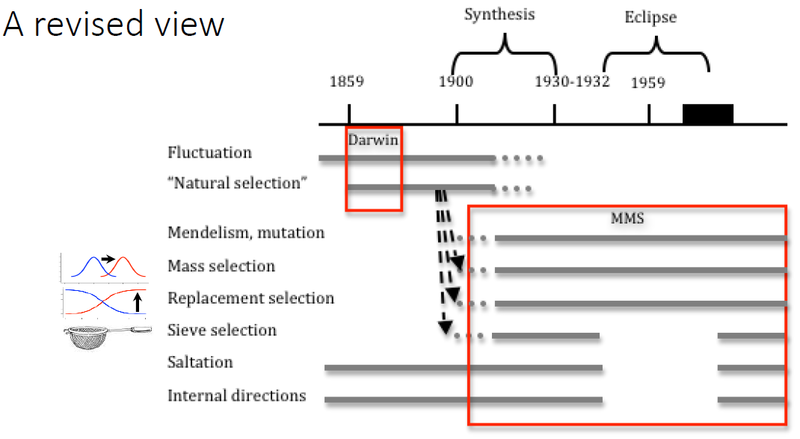 In Figure 1, the classical view– The Mutationism Story– makes it very simple: Mendelism is implicit in Darwin’s view (the missing piece), and just needs to be combined with selection, which the mutationists were too stupid to figure out. In Figure 2, Gayon’s innovation is to recognize a discontinuity between Darwin’s concept of selection and the Mendelian concept. Darwin rejected the idea that evolution proceeds by the replacement of one true-breeding type by another, rather than a mass shape-shifting. But quantitative genetics following Fisher’s idealized view (change in a quantitative trait affected by infinitely many sites with infinitesimal effects) allows a work-alike version of Darwinism. 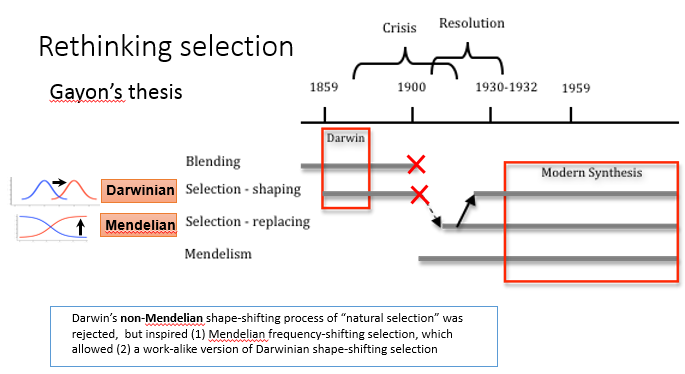 So we can draw an arrow to show how shape-shifting selection was built on top of Mendelian selection, rehabilitating Darwin’s view. What the 3rd Figure recognizes is that we are all Mendelian-Mutationists today. There was a period of eclipse– the heyday of the Modern Synthesis– during which certain non-Darwinian ideas were heretical. Practicing scientists today are taught that the Modern Synthesis is the foundation of evolutionary thinking, but this is not correct. The view presented in the Modern Synthesis was a narrow, special case of Mendelian-mutationism that is no longer accepted. However, because the architects of the Modern Synthesis were so successful in creating a historical narrative that distorts Mendelian-mutationism, scientists today do not understand that their actual legacy is from Bateson, Punnett, Morgan, Johannsen and de Vries.